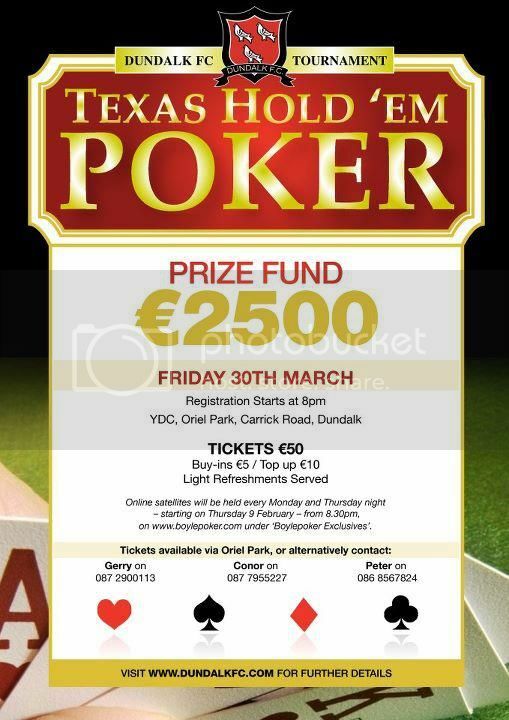 Dundalk FC are holding a Texas Hold'em Tournament on Friday 30th March at 8pm in Oriel Park. Tickets cost €50 with Buy-ins €5 and Top ups €10. Online Satellites wil be held every Monday and Thursday night from 8:30pm on boylepoker.com under "Boylepoker Exclusives". Call Conor on 087 7955227 or visit www.dundalkfc.com for more details. Great to hear about this, is this a regular game in Dundalk , or just a once off ?